Photo credit : Nicholas George Photography, Digby Shaw, Henry Jaine and Dillan Gerschwitz. We hope everyone had a great day! Thank you for coming and see you next year! The Coppermine Mountain Bike Event weaves through some of Nelson's best back country trails and traverses, the spectacular Coppermine Mineral Belt and Dun Mountain. There are Two courses to cater for different riding abilities. 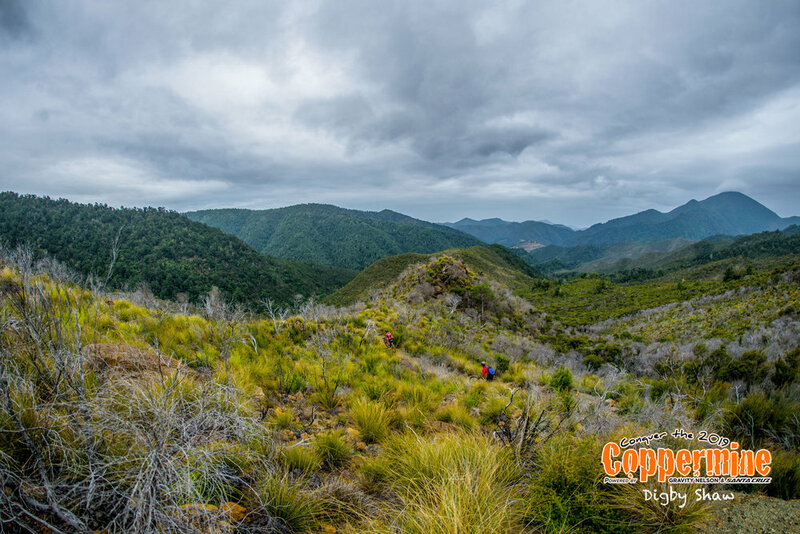 The Coppermine course is a stunning loop of the Dun Mountain Trail all the way to the mineral belt at the Coppermine saddle, where this unique event takes its name from. The Coppermine Epic course has the extra climb to the top of Fringed Hill (900m) and the amazing native forest singletrack descent of Black Diamond Ridge added to the mix and is suited more to the experienced mountain biker. Both courses descend the Boulder Valley, catering for all abilities, with an incredibly fun and flowing piece of single track. It's a wrap for "Conquer the Coppermine 10th February 2018"
The race went off without a hitch, and we even managed to dodge the rainstorm! Thanks so much to everyone that raced, volunteered, helped, watched, and otherwise participated. You can download a pdf of the category results HERE and a pdf of the full results in race time order HERE. It has the best volunteers who not only guide you around the course, but also make this event possible. All riders get a free Sprig and Fern beer/ginger beer and food at the end of the event, which is perfect to enjoy while riders sit in the sun with friends and family, reminiscing over the ride. As they have been and always will be. New for 2018 are our Team categories. You can enter as a Parent & Child Team, a Family team with plus 3 team members of close or extended family or Corporate team with 4 members (mixed). Sign your son or daughter up or convince mum and dad this could be a great day out together. If you have mates at work you usually go riding with sign up as a Team and have some fun outside of work. They race over the Coppermine Course. Also new for 2018 is the Single Speed category, for those certified maniacs of you out there. Missing the fun you had at the single speed world champs? Come along and dress up and us how its done. It races over the Coppermine Course. The event has always had a King and Queen of the Mountain. The King and Queen of Descent is crowned again for 2018. Riders still need to ride the whole course and finish to be eligible. The first event in New Zealand to offer this category. It races over the Coppermine Course. Love them or hate them, ebikes are here and will test a different set of skills for riders. Check the Event Information for the ebike criteria. $$$ are up for grabs for the first male and female to beat the existing Coppermine Epic records, which are currently held by Kim Hurst (2013) and Tim Wilding (2012). Watch the video below for a sneak preview of the treat you are in for! Nelson's epic mountain bike race. CONGRATULATIONS to all the participants of the 10th anniversary 2017 event. For full results, click here.